Next step in creating Azure IaaS is adding VM to VNet we previously created. 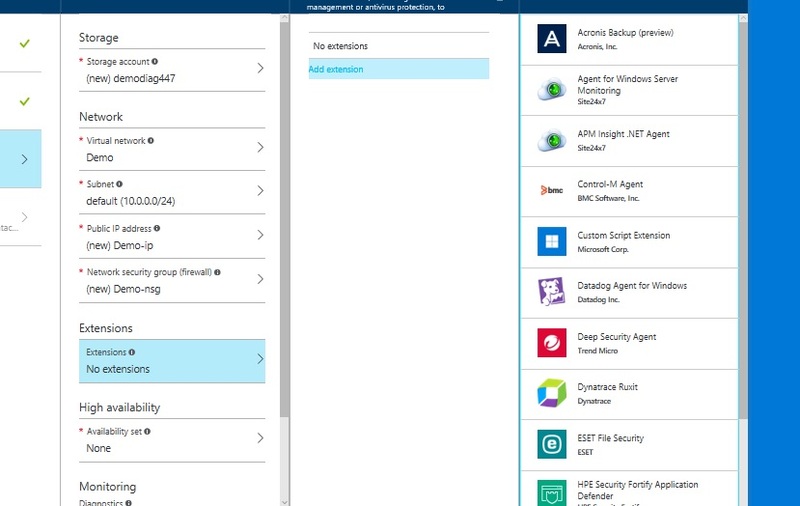 In Azure portal select ‘New’, then ‘Virtual Machines’ and then select OS you want. 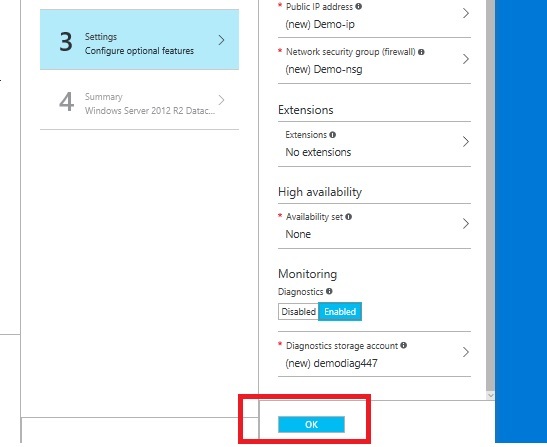 In this case I will select Windows Server 2012 R2 Datacenter. New tile will open and this time it will have more options then VNet. New tile with VM size will open. Select size of VM and click OK. For demo I will use A1 Basic. Third tile will open with optional settings. First option is storage account. 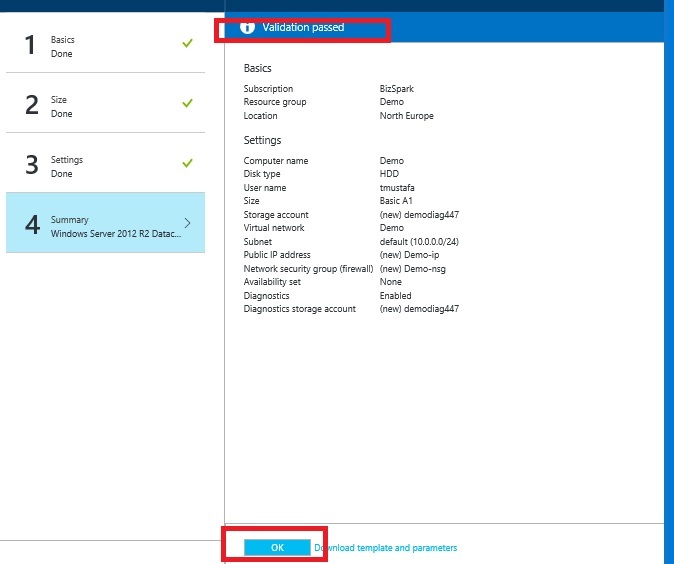 If this is not first VM in your resource group, existing storage account will be selected. If this is the case, you can leave existing storage account or chose to create new for your VM. 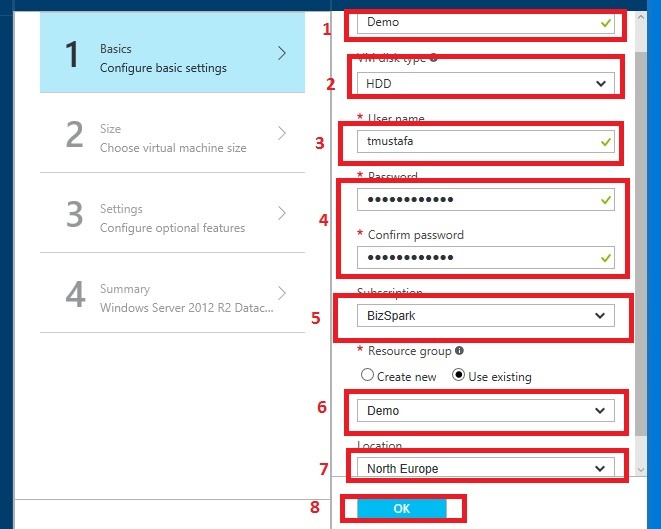 If this is first VM in your resource group, new storage account will be automatically created. In case you selected HDD, you can choose if your storage account is locally redundant, geo-redundant or geo-redundant with read access. In case you selected SDD your storage account can be only locally redundant. In network section you can select previously created VNet in your resource group or you can select to create new one. In subnet, you can choose from subnets that are created under VNet you selected. We’ll talk more about subnets under VNet in another post. In Public IP address, you can create new public IP address for your VM and chose if address will be dynamic or static. Network security rules allow you to configure firewall rules for your VM. By default, only RDP is allowed to give you access to your VM. You can add additional rules if you want to configure your VM via PowerShell, use it as Webserver etc. In extension section you can add various predefined extensions to your VM like backup software, antivirus etc. In availability set you can choose if you want to create one or not. To create one, you will need at least one more VM created. Creating availability set doesn’t mean that you have failover, you still have to configure those options additionally. This means that VMs in availability set will not be disturbed by Microsoft at same time for patching, maintenance etc. I will not create such set at this time. 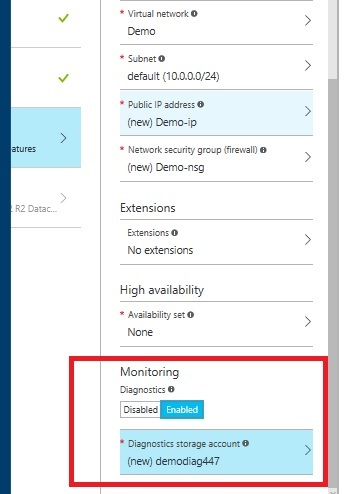 Last option is monitoring where you can disable or enable it. By default, it enabled and I strongly advise you to leave it that way. Will talk more about monitoring in one of next posts. Also you have option to choose were monitoring logs will be stored. It will be in same storage account as your data disks by default but you can choose different storage account if you want. Validation will check and after it passes you will need to click one more OK to start deployment. Deployment time depends on size of VM you chose, OS and disk type. It can take from few minutes to half an hour to finish. Once done you can access your VM and configure it any way you want. 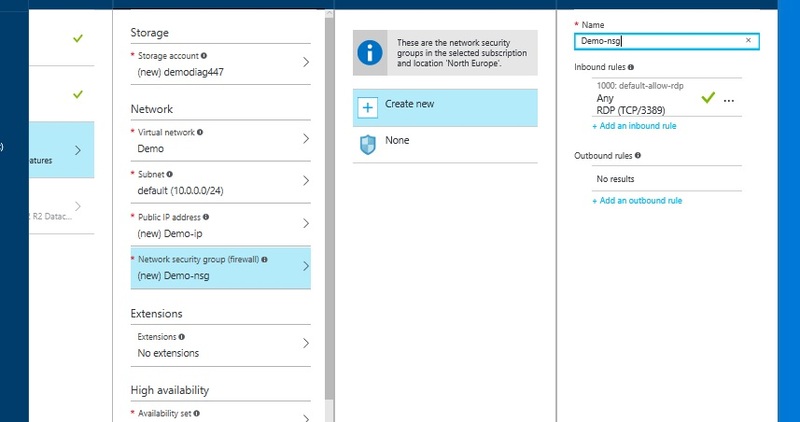 By adding more VMs to same VNet, you build your own Datacenter in Azure and allow network traffic between those VM. We’ll talk about what and how in one of next posts. We would like to thank you just as before for the stunning ideas you gave Jesse when preparing a post-graduate research and, most importantly, regarding providing the many ideas in one blog post. Provided we had known of your website a year ago, we would have been kept from the needless measures we were selecting. Thank you very much. I created VM, installed IIS role but can’t get my website to work. I wrote about that in post right after this one. I can’t wait for new posts from you! Keep great work ! 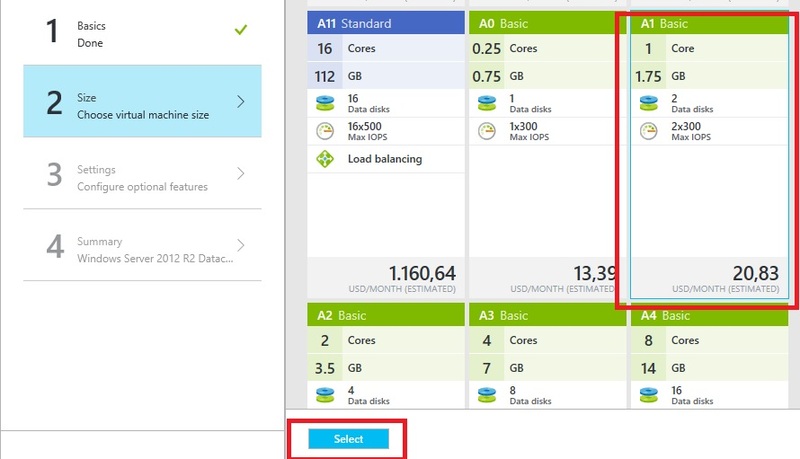 Great series of post related to Azure! Very helpfull!